Though the rest of the area is no longer experiencing heat. My towering apartment is anything but cool. With my eight year old home for the long weekend I had to come up with something fun that will cool us off. While giving the baby a bath I thought to myself at least she will feel cool. Then I figured why can't we all take baths. After her bath I put her down for a nap. 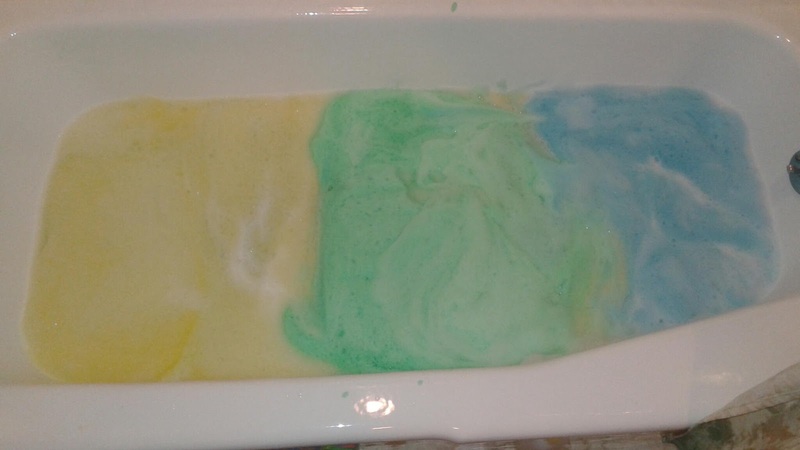 Once she was out like a light I drew myself a bath with a bath bomb from Lush. If you haven't been to a Lush store you have no idea what you are missing. If there are no Lush stores near you, order from them online. They are amazing natural products. I soaked in the now pink scented water with little seaweed paper pink hearts floating around me. Loreena Mckennitt played softly from my phone. I was in bliss! Then came time for my oldest's bath. She loves baths and had already used her own bath bomb and a half of mine. So I had to come up with a different bath for her. The girl loves bubble baths but I took it a step further. I took the Dawn and with a bit of water in a bowl I whipped up a bowl full of foam. This is not like a normal bubble bath bubbles, these are dense soap foam. I then added food coloring all around the bowl (it didn't mix well so I learnt you can just dump the food coloring in the middle) then I later the foam on top of the already drawn bath water. I had to do two bowls for one color. I did this for another two colors. You could make the foam bigger or do more colors. In the future I think I will make bowls of colored foam and add them one after another. The first color I put down ran all over the place by the time I whipped up the next color. She had a blast. The color washed into the water after a bit of playing but it was fun. She enjoyed mixing all the colors making swirls. Give it a try. It's a mess if you are not careful with the food coloring. I think I dyed my bathroom sink green. But I still enjoyed surprising my daughter with this cool bath. Messes are a part of life, thank goodness for rubbing alcohol!